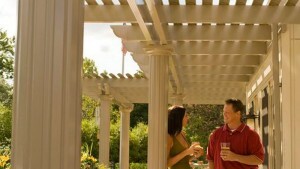 U.S. Patio Systems and Home Remodeling is an authorized TEMO pergola dealer serving the Des Moines, Iowa, area. What does that mean? It means that we sell and install the finest pergolas made in North America. TEMO pergolas are state-of-the-art shade structures that offer many advantages over pergolas that are made simply out of treated wood. Every TEMO pergola is made of heavy-duty extruded aluminum and electrostatically treated to ensure a virtually maintenance-free finish. Please contact U.S. Patio Systems and Home Remodeling if you would like more information about having a TEMO pergola installed at your home in or near Des Moines, Iowa. We are an authorized TEMO pergola dealer that also proudly sells TEMO sunrooms, TEMO covered patios, and TEMO screen rooms.